Rocky Neck State Park is located on Long Island Sound in East Lyme. Consisting of 710 acres of camping and recreational areas, the park’s western edge is bound by a tidal river and a salt marsh to its east, making it an ideal habitat for a wide variety of fish and wildlife. Recognized for the abundance of natural provisions it offered, the area around Rocky Neck State Park proved popular with Native groups and early European settlers alike. By the 1800s, local farmers utilized these resources by hauling seaweed and kelp from the area waters for use as a fertilizer in their cornfields. By the time of the Civil War, small fish replaced the seaweed as the fertilizer of choice. The practice of using fish as fertilizer proved so popular that entrepreneurs built a factory to dry and store the fish on what are today park grounds. A fire destroyed the factory in the 1890s, but a larger, concrete one took its place. When the fertilizer business dried up, the factory ceased operations. Because tearing down the factory was such an immense task, and the old building emitted such a foul odor, developers bypassed the area, leaving the grounds in near-pristine condition. It was then that the idea of turning the area into a park took root. The state first considered purchasing the land in 1920 but had inadequate funds to do so. In 1929, a bill introduced into the state assembly appropriated $200,000 for this same purpose, but politicians rejected it. 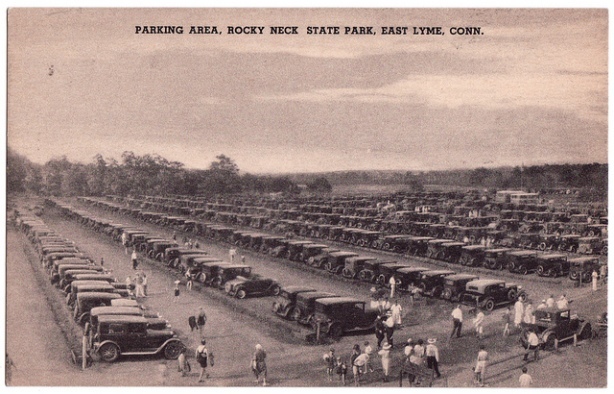 It was in 1931 that a bill finally passed allowing the state to purchase the land and build a state park. Shortly after, as part of a Works Progress Administration (WPA) project, the state began construction of a pavilion meant to draw shore-goers away from the overcrowded Hammonasset State Park. Measuring 350 feet long by 80 feet wide, the Ellie Mitchell Pavilion offered visitors food and dining areas, as well as eight fireplaces for warming themselves during cooler weather. Much of the materials for the pavilion’s construction came from local timber suppliers and granite quarries, as well as from the dismantling of the abandoned fish fertilizer plant on the grounds. 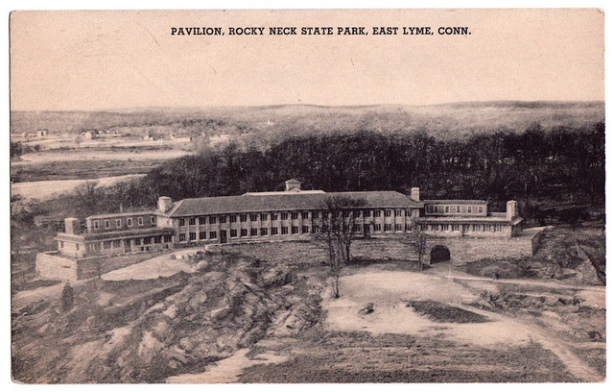 The pavilion’s completion helped draw throngs of visitors to the East Lyme shore, a trend that continues today. The modern recreational enthusiast enters Rocky Neck State Park to find sandy beaches, picnic areas, hiking trails, and numerous opportunities for crabbing and fishing. Fish such as herring, mackerel, and striped bass frequent the park’s waters, while ospreys, swans, and cranes navigate the skies overhead. Additionally, the park boasts over 150 campsites allowing both the casual and serious camper to spend a weekend or longer reconnecting with the area’s abundant natural resources.